Do you ever feel a dull, tight, achy, stiff pain between your shoulder blades in your mid back that just seems impossible to stretch out? Good news! It is not impossible. You may just not be stretching the correct area. 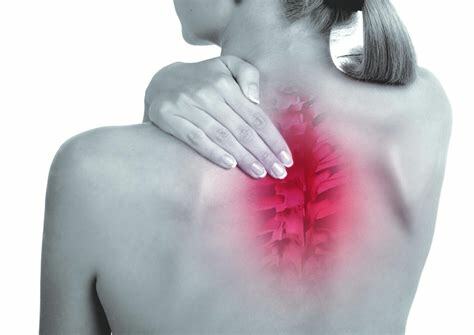 When I have patients experiencing mid back pain or discomfort, they seem to have tried every shoulder or neck stretch they can think of or google, with no relief. These patients typically sit at a desk or computer for long periods of time. 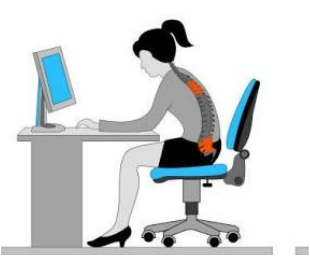 However, standing for a prolonged time, repetitive overhead activity or general poor posture can also cause pain. Your spine consists of 33 vertebrae, all stacked one on top of the other and all effecting the other. The neck and low back areas of the spine are designed to be more mobile, which is why pain and injury is more common in those areas. The thoracic vertebrae are the stabilizing connectors between the two. It also anchors your rib cage, which has to be sturdy enough to protect all your vitals organs. The tightness that you feel occurs because your thoracic spine can actually be “too good” at stabilizing and becomes hypomobile (decreased movement). Joints like to move, so when they are maintained in the same position for a long time, they get stiff and achy. Therefore, when you sit in a slumped position (see picture below) you are asking your thoracic spine to hold you up when you should be relying on your abdominal and back muscles to help. To counteract the added stress and load placed on the vertebrae, you have to get those vertebrae moving! Here are my favorite exercises to increase thoracic movement and decrease mid back pain! On your exhale, reach your arm across your chest as if you were going to rest your right shoulder on the ground. Again, try to keep your hips still. Hopefully you find these exercises helpful, however, if pain persists please schedule an appointment with your Primary Care Physician. If you enjoyed these exercises and want to learn more or have a skilled physical therapist evaluate and design a specific treatment program for you feel free to contact Atlantic Physical Therapy via phone 215-271-4100 or email info@aptphilly.com.